Welcome back to the R29 Book Club! If this is your first time with us, we've just gotten through the middle portion of The Goldfinch. So, let's dive right in. First, congratulations to Theo (and to us, as readers) for escaping the hellish desert that was Las Vegas. At one point, I may or may not have described the middle portion of the book as "time standing still." But, looking back at it now, a lot of stuff happened in this section, which means that time wasn't moving so slowly, after all. It's a nice little metaphor for life on Tartt's part — even if it wasn't intentional. We rejoin Theo in New York, just as he's being ripped from the safety of the Barbour home by his deadbeat dad and Xandra. With the treasured painting stashed inside his luggage, he's whisked away to the lonely, isolated 'burbs outside Vegas. Here, we meet Boris — and embark on what could easily be the most depressing adolescence in popular fiction. Drugs, teen angst, neglect, abuse, malnutrition — it's all here, and it makes for some of the hardest reading of the entire book. One scene I can't shake: Thanksgiving, when Theo discovers that his dad and Xandra have holiday dinner plans that don't include him. Seriously, can your heart break any more for this kid? I started to wonder if Theo wouldn't have been better off taking his chances in the foster-care system after his mother's death. His obsession with the painting hums along. He worries about the air quality and dampness in the house ultimately stashing the purloined piece in his school locker. This might be Theo's only decision that really doesn't make sense, given how careful he is about the painting; he surmises that having it found by a teacher or security guard at school would be better than his father or Mr. Silver finding it. But, couldn't the former situation lead to criminal consequences, while the latter most likely wouldn't? "When I looked at the painting I felt the same convergence on a single point: a flickering sun-struck instant that existed now and forever. Only occasionally did I notice the chain on the finch's ankle, or think what a cruel life for a little living creature — fluttering briefly, forced always to land in the same hopeless place." It's Theo's life, summed up in two brief yet brilliant sentences. 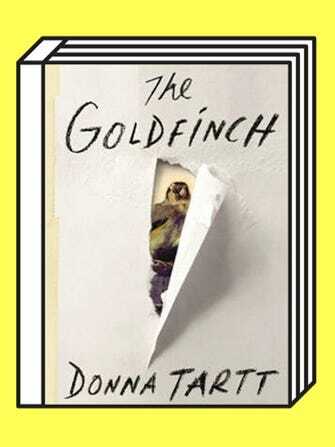 He is the goldfinch, occasionally rising above his dire circumstances but ultimately tethered — by grief, drugs, his father, his friend Boris, or the painting itself — to a life of sadness and guilt. Side note: I'm on the fence about Xandra. I imagine her as a sort of washed-up Goldie Hawn character, physically, and her only saving grace is that she brings food home from work for Theo and Boris. She winds up being a good deal more complex than I first thought, which is a testament to Tartt's prowess at character development. But, the moment, toward the end of this section, when Theo reams her out for taking his mother's earrings? Brilliant. And, I'm not afraid to admit that I silently rejoiced when we learn that Theo's dad is dead. Let's not forget, this is the guy who'd just tried to steal Theo's inheritance, under the guise that he'd opened his son a savings account. His death brings a much-needed wave of relief. At this point, Theo has to make a decision: Stay with Boris and possibly end up a bum in California (no, no, no!) or beat it back to New York. Finally, after a surprise goodbye kiss from Boris — c'mon, we knew this was coming, right? — and a never-ending bus ride with Popper that left me with jangly nerves, our hero makes it back to his hometown and lands safely (albeit with a crushing drug habit) to rejoin his old friend Hobie. Whew — at least for the moment. Tartt masterfully changes the pace of the plot to keep up with the relentless hum of New York City — a far cry from the crawling tempo of Vegas' snoozy suburbs. Theo's life is one big adrenaline rush, with pieces falling like dominoes. His job with Hobie leads him to a storage unit, where he can finally secure the painting, but it also leads him into selling Hobie's hodgepodge antiques as originals in an attempt to dig the shop out of debt. We're reunited with the Barbours, kind of. The loss of her son Andy and her husband has made Mrs. Barbour an entirely new character — the kind, gentle mother figure we've been waiting for this whole time. In the last moments of this section, we meet the chillingly slimy Lucius Reeve, who stands to be Theo's undoing. Reeve has not only caught on to Theo's less-than-honest antiques dealing, but he's also pieced together the fact that Theo was the only survivor in the room with the missing painting. Aghhhhh when will it end? This twist is so clever and out of the blue, we have to applaud Tartt for her ability to hook us for another 300 pages to watch the plot unfold. As always, I welcome your comments and insights below! Join us next Friday, March 28, for the final discussion on the remaining three chapters and the book as a whole. Happy reading!